Newborn sleep patterns vary significantly in the early days, but many new parents want to know when they can put their baby on a schedule and what to expect. 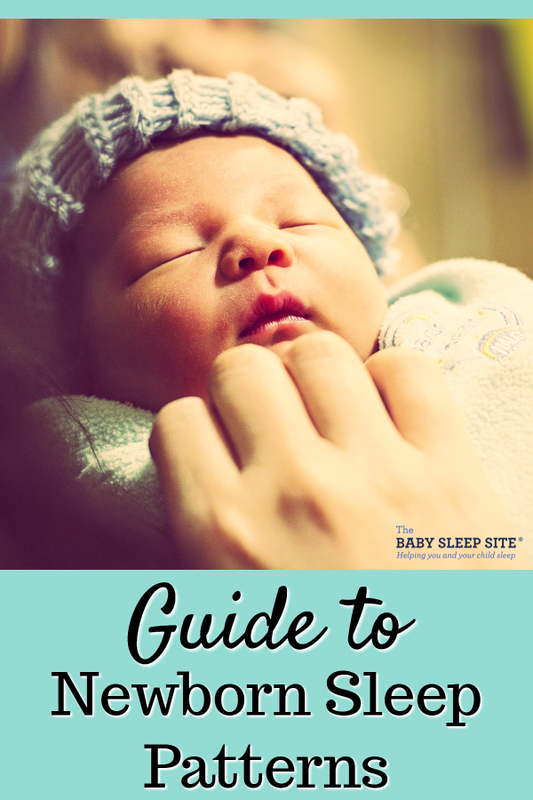 This guide will teach you about your newborn’s sleep patterns and how they will change over time. When your son or daughter was in mom’s womb, mom’s movements during the day lulled your newborn baby to sleep and when mom rested at night, you may have noticed he or she perked up. He or she may have started kicking or doing acrobatics when you nestled in bed for the night. Once she is born, she does not automatically know she is supposed to do precisely the opposite! It takes a few days to several weeks for this to be sorted out, but it will get sorted out. Of course, this is tiring for us, parents! Since babies sleep a lot, day and night, you may not notice this day/night confusion for a couple of weeks. At first, you will likely feel like you are feeding and change diapers around the clock. And, just when your exhaustion really starts to set in, you might start asking yourself when your newborn will start sleeping more at night than during the day. If your baby is taking 3-4 or even 5-hour “naps” (eating in the middle and going back to sleep) but only sleeping 1-2 hours at a time at night, you know your baby is still mixing up days and nights. If your baby is more than 3-4 weeks old, be sure to download our free e-Book below to learn how to fix it. When your baby is first born, he will sleep more than be awake. Newborns sleep about 16 hours per day and wake time includes any feedings. As the weeks go by, they will be able to stay up longer, but still, will sleep 14-16 hours in a 24-hour period by one month of age. By 3 months old, the average amount of sleep in 24 hours is still 14 hours. A newborn baby will also cry 1-2 hours per day (in total, not all at once, usually). This is normal. It is the only way babies can communicate to tell us whether they are hungry, tired, uncomfortable, wet, etc. Unfortunately, some babies will develop colic (bouts of intense crying that’s difficult to soothe and the causes unknown) when they are just a few weeks old. The crying might last hours per day and colic usually ends around the 3 or 4-month mark, hopefully not longer. When can you put your newborn on a schedule? Depending on your baby’s sensitivity level to being overtired, a schedule may not form until after he is 6 months old or longer. My first son, who is the primary reason this site even exists, did not get “good” at a schedule until 7 1/2 months because he just could NOT stay up long enough without becoming so irritable and cranky. Many parents desire a schedule much sooner, especially if you have twins, but if your baby is sensitive to overtiredness, you will only sabotage your own efforts because he will get overtired and fight sleep more, not less. This is one of the most misunderstood facts of a baby’s sleep needs, in my experience. Many people might tell you to keep your baby awake such that he will sleep more at night and other advice like that (I heard a lot of it when my son was such a challenging sleeper!). Unfortunately, this will only lead to more and more sleep-deprivation that will make him fight sleep more and thus lose more and more sleep until he’s one big overtired cranky mess. If that is what has brought you to this site today, try to keep wake times short and become in tune with when baby needs to sleep just as much as you are in tune with when he needs to eat and some of your problems may be resolved as simple as that. Looking for a newborn sleep schedule? Do I go to bed at the same exact time every night? Do I wake up at the same time every morning? Do I wake up to go to the bathroom at night at the same time? Do I get hungry and eat meals at the same exact time every day? If you answered no to any of those questions, you are likely realizing that your baby isn’t much different than maybe you are! If you answered yes to all of them and your baby does not follow suit, ask your partner or make sure you brought the right baby home. Kidding! I have no scientific basis for thinking this is a hereditary, just a hunch. My first son was and still is highly inconsistent. Although I am too, it’s still hard to parent sometimes, especially given my “planning” personality. I used to log and track and track and log looking for patterns and all I found was that he had none. It took a long time, but I finally had to let it go and realize the only thing consistent about him would be that each day would be different. 🙂 And, it was. Looking at myself and my own patterns helped me take the pressure off him to be the same every day. Regardless if your baby is consistent or not, the same sleep patterns generally emerge from all newborns. It still helped me a lot to track his sleep because it helped me know how many hours per day he’d typically sleep and I did start to see a pattern of when he’d wake in relation to dinner, not bedtime. 10 Tips to Help Your Newborn Sleep. 7 Gentle, Natural Ways To Help Your Newborn Baby Sleep Better. Essential Keys to Your Newborn’s Sleep. This is the perfect guide for new and expectant parents! It highlights the basics that every new parent needs to know about baby sleep, and it explains them in a straightforward, easy-to-understand way. Even better, the e-Book leaves plenty of room for parents to follow their instincts, and to create their own philosophy of parenting and sleep – no one-size-fits-all approaches here! This e-Book also comes with a blank sample sleep plan; this sample plan will give you a great overview of exactly what our signature Personalized Sleep Plans® contain.